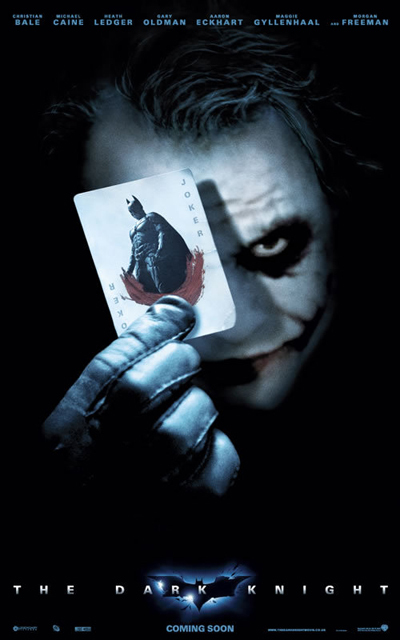 The Dark Knight………… Well as most of you know I’m not a comic book fan what so ever. i feel as though this new generation of comic book movies has been ripped from the trembling hands of nerds to be a bit better. Although don’t get me wrong even in this new style the nerds still get their due. over all the Dark knight was a good movie. As you may have already heard Heath Ledger does a respectable job as the joker. Christian Bale is a very convincing batman and more realistic Gotham City is quite engaging. Here’s the things kate and i just couldn’t figure out. 1. Why in god’s name do people continue to live in Gotham City? Ok Maybe it has great restaurants and bars. The reconstruction industry is obviously booming with all the destruction, so jobs are abundant. Is it worth it though? 2. Why is it that when Batman talks he sounds as if he’s been smoking and screaming for 6 hours. I know it’s suppose to disguise his voice and make him sound tough but come on it really just sounds as if he’s an anxious chain smoker. 3. Why, when batman is depressed does he stand atop the tallest building in town? With that said how does he get up there. He doesn’t have super powers (can’t fly). This means that in the evening, he’s driving into town in the bat mobile, parks in the garage, then sweet talks security into letting him take the elevator to the top. If your asking me that’s just a little more than embarrassing. Don’t get me wrong – none of these questions are deal breakers for the movie it’s just some unanswered questions. In other news i went to post some pictures from the SSP and my iphoto is a bit more than deficient of shots. I putting the the call back out to you the faithful to send in some more shots i can use. Bight thanks to those of you that have already sent in. Sam, Jon,and Steve. i need to so through and pick some of those out for official posting. Either way thanks again everyone for a great time.